﻿Our mission is to bless others with all God has given us. The majority of the produce grown here is donated to those in need. 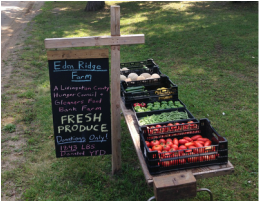 Eden Ridge Farm is part of the Livingston County Hunger Council. ﻿Our roadside stand is open about one day a week during the summer months. Produce is sold on a donation basis; these donations help us to provide food for those in need. We generally will post on Facebook when we have the stand set up. Click the link below for a current list of produce available. We would love for you to join us in our mission! We have set work days for volunteers, and also welcome small groups at a time that works best for you and your group.